As Democrats and Republicans prepare for Election Day, the Junior Fellows and Samuel Walker Houston Elementary are preparing for the future—by teaching kids the importance of voting. The Junior Fellows arrived at Samuel Walker Houston Elementary on Monday to host a mock election for students, who learned by actually casting ballots. Stacy Bennett, principal at Samuel Walker Houston Elementary, agreed. 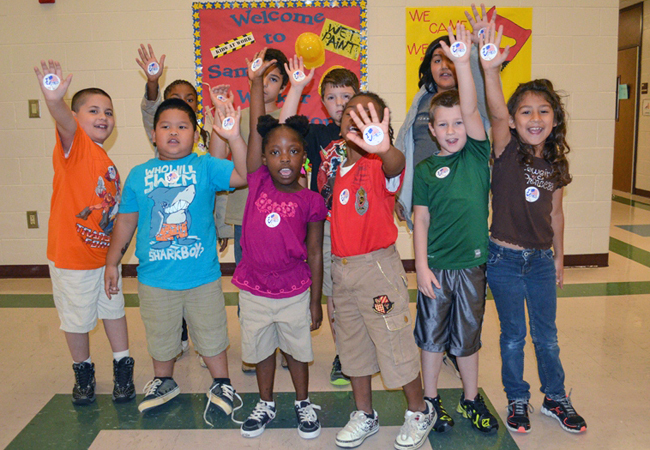 The exercise involved students in kindergarten through fourth grade and was customized to the age group. Students waited in line to vote and were given ballots when they reached the “election clerks.” After receiving their ballots, they moved to one of several tables set up to preserve their privacy. Bennett also wanted the students to learn as much as possible from the act of voting. Accordingly, she has encouraged her faculty to address civic education during the election season. Also fun was tallying the final results. Irrespective of what the nation’s voters decide today in the presidential election, President Barack Obama can sleep well tonight knowing he has the students at Samuel Walker Houston Elementary in Huntsville firmly in his corner. The final results showed that he received 66.7 percent of the 564 votes cast, with Romney receiving 33.3 percent.